Three 4 berth caravans for rent. (all the details on FB page) prices from £150/week. 3-4 nightly rental also available - Phone for details. 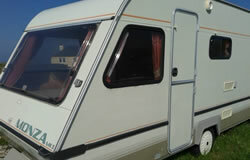 Pitch at South Boisdale machair or can arrange to tow or have it taken to one of the camp sites.